To see a map of frontier conflicts that happened in Western Australia, please follow this link. All coordinates are approximate. This map is being developed as time permits and may not fully reflect the list below. Locations will be added to the list below as new information is found and time permits. If you know of incidents that occurred, not included and wish to contact the author of this website, please use the form on the Contact page. 11 July 1833 Perth area, WA, Yagan killed. 28 October 1834 Pinjarra Massacre, or Battle of Pinjarra, near Murray River, WA. A detachment of 25 soldiers, police and other colonists, led by Governor James Stirling, attack up to 80 Noongar people on 28 October 1834. The attack follows earlier unrest caused by the dispossession of Noongar people after the arrival of the British in the area. The exact number of Aboriginal people killed or wounded is not known but could have been up to 30 or more. By contrast only one colonist is killed and one injured. August 1836 York area, WA? (Individual entries are also included below for these places). 1890–1896 Western Australia, conflicts between pastoralists and Aboriginal people continue. 7 July 1894 Kalgara (Mount Margaret) district, WA, P. Mack 'tomahawked'. 30 July 1894 Four miles south of Brickey's Soak, Kalgara (Mount Margaret district), WA, 30 to 40 Aboriginal people, armed with spears and clubs, attack D'Arcy Uhr, Michael Galway and George Alexander at 3.00 pm in the afternoon. A nearby camp of six men assists Uhr's party to save their camp. An Aboriginal man kills one of the intuders on their Country, wounds another. Early 20th century Wirdim Country, Kimberleys, WA, Aboriginal people spear a European stockman. The world's longest historic stock route runs 1,780 kms, through the desert, between Halls Creek and Wiluna, Western Australia. From 1906 Alfred Canning and his team begin surveying a route between waterholes that could be opened up for watering stock on their way from the Kimberley region to Wiluna. The wells along the controversial stock route become sites of conflict between Aboriginal cultures and western culture. Conflict on the stock route is triggered by, and in response to, the men who built the wells on Aboriginal Country and to the drovers who used the wells. In 1907, during Canning's return to Wiluna, Michael Tobin and Mungkututu clash at Natawulu (Well 40). Tobin is fatally speared as he shoots and kills Mungkututu. The reasons for the incident vary. In one version, Tobin had taken Mungkututu's wife, in another Tobin's spearing is revenge for the theft of Aboriginal sacred objects by Canning's men. As part of the multifaceted Canning Stock Route Project, from 30 July 2010 to 26 January 2011, the National Museum of Australia, Canberra held an exhibition, Yiwarra Kuju: the Canning Stock Route. An accompanying publication by the same title includes paintings of conflicts that took place in this area of Western Australia. 30 March 1915 Mistake Creek, near Warmun (Turkey Creek), east Kimberley region, WA. A police report records an attack on an Aboriginal camp at Mistake Creek by three men on 30 March 1915. 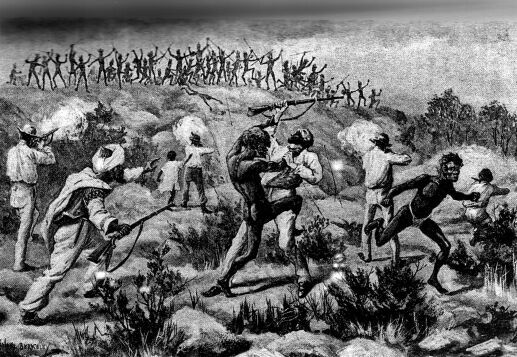 Three Aboriginal males are shot dead, five Aboriginal females captured. A wounded Aboriginal man escapes with at least two other people. The women and girls are made to cart firewood. Bodies of two dead are then burnt. The women and girls are then taken to another part of the creek then shot. 1920s? Ruby Plains Station, Kimberleys, WA, the owner and manager of Ruby Plains Station shoot and decapitate Aboriginal men found butchering a bullock. The heads of the murdered men are placed in a hollow tree. Crows hover over the dead men's bodies, alerting friends to their whereabouts. 1920s? Lajipany (Horseshoe) Creek, Texas Downs Station, Kimberleys, WA, after some Gija people drove off a group of bullocks, pastoralists pursue and shoot most of them, burning the bodies to hide the evidence. A small Aboriginal boy escapes by hiding in a creek near Minyjiwurrji, where his mother later finds him. Tensions between Aboriginal people and pastoralists heighten as pastoralists expand stations across the Kimberley in the 1920s. More than a dozen Aboriginal people are believed to have been killed at Sturt Creek in October 1922 by police when they are sent to investigate the deaths of two pastoralists, Joseph Condren and Tim O'Sullivan, at Billiluna Station. While the activities of police at Sturt Creek were not documented, oral testimony of Aboriginal elders described police shooting at their people at Sturt Creek. According to survivors, after police ammunition ran out, some remaining Aboriginal men, women and children were chained up and marched to a place near old Denison Downs homestead where they too were shot. It is alleged that the bodies of the deceased were tipped into a well nearby and burnt. A team of Flinders University-led archaeologists and forensic scientists has conducted a fresh study of Aboriginal massacre sites in the Tanami Desert near the Western Australia-Northern Territory border. Lead researcher, Dr Pam Smith, said that while some of the results were inconclusive, the findings of the most advanced study of the alleged 1922 Sturt Massacre had backed up local Aboriginal elders' oral histories of the events that have been handed down to relatives of survivors. c. 1924 Bedford Downs, WA, Bedford Downs massacre. The manager of Bedford Downs station gives Aboriginal workers strychnine-laced rations of beef, bread and ham from which they begin to die after eating. As the people are dying in agony they are shot. The bodies of the dead are cremated using wood the manager has made Aboriginal workers collect previously. There is only one survivor who escapes to a hill where horsemen are unable to follow. © Jane Morrison 2015–2018. Compiled from the sources listed above, in the Bibliography and Journal Articles. No responsibility taken for errors in primary or secondary sources.